Its been another beautiful day back here in the holler. There was snow on the ground but the sun soon melted most of it away. A little sunshine sure makes a body feel alive especially when the January temps hit a balmy forty degrees. Mother Nature has duped us into believing its spring instead of the dead of winter. The sap in our limbs has warmed a bit and the golden rays of sunshine has prompted us to leave the den for some much needed fresh air. This was a perfect day to use the solar oven. Sonny carried it out of the root cellar where its stored and placed it in a position where it would get the most sun. We put a couple of sweet potatoes inside to bake. They along with a salad would make a tasty lunch. 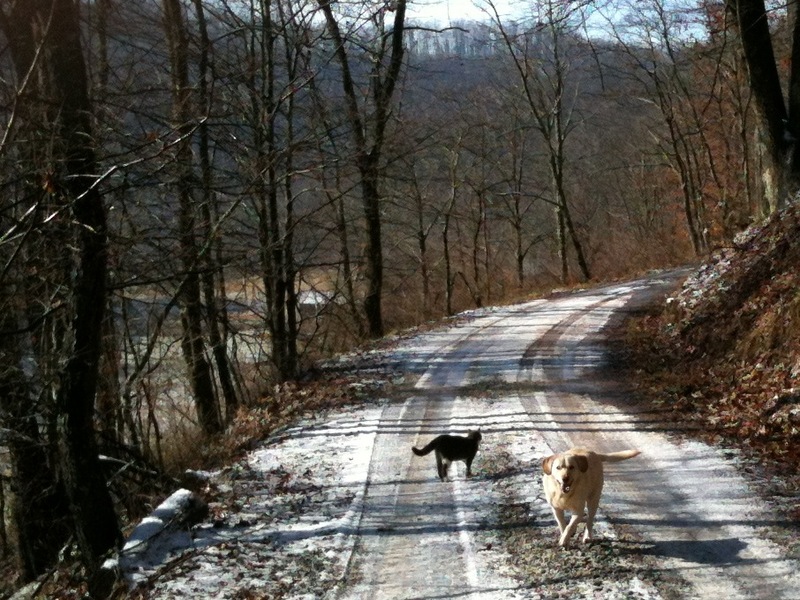 While our sweet potatoes were baked by sun power we took a little walk down the road that leads to our house. Our best mates Ruby and Moby came along too. Even they get weary of confinement and lack of exercise. We started on our leisurely stroll with Ruby and Moby leading the way of course and reminisced about the blackberries we picked last spring along this very road. The bushes are dormant now in winters sleep, the vines withered and dry. With the leaves gone from the brush we could see a leaning stack of old white bee boxes near an out building of the ghost farm. Ancient apple trees with their unpruned twisted limbs stood watch. The old farmhouse with its peeling white clapboards and rotting porch looked tired, but I can just imagine what it might have been in its heyday. A flurry of activity. The bee boxes would have been in use collecting the yellow gold of honey. The scent of lilacs and apple blossoms would ride on the breeze that blew across the laundry hanging from lines strung on the front and back porches. The lowing of cows could have been heard by the lady of the house as she baked bread. Her husband would have been busy fixing a tractor tire in the barn or setting up his gear to make hay while the children swung from the tire swing that still hangs from an old sycamore tree. Gas was used to run the lights and the refrigerator, not electricity, and surely a wringer washer is still waiting for the next load. The family is gone now. Only a tired run down farm remains along with rusted farm machinery, broken bee boxes and the clothes line still strung on the front and back porches. Its a sad sight, because it could still be renewed for a another family, but I believe that its time is winding down. We past the ghost farm and strolled down the hill until we came to the old school house. Its another reminder of past generations who raised their families in this holler. Its cut stone foundation leans and the tin of the roof is rolled back in spots. Its a reminder that time marches on and makes one wonder what will become of our farm when we are gone. Will the PV arrays still stand? Will the house become broken down, the porch swing idly swaying in a breeze? Even so, the signs of life will still be here. The sounds of contented hens, Ruby snoring under the walnut tree and the hum of a dulcimer will forever echo in these hills. 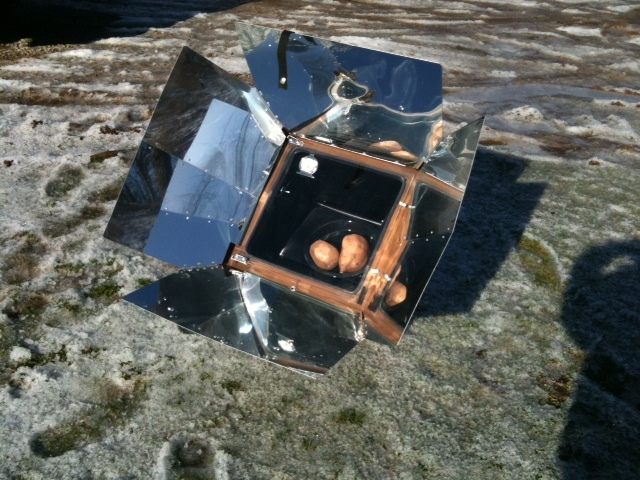 Sweet Potatoes in the solar cooker. 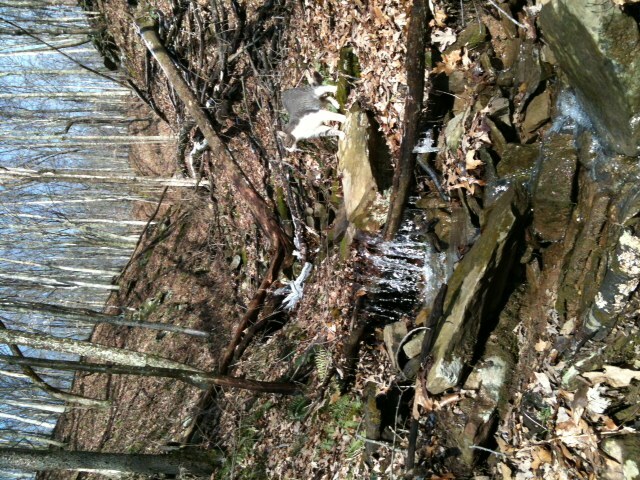 Moby by the trickling water. This entry was posted on Sunday, January 22nd, 2012 at 6:06 pm and is filed under Cats, Chickens, Dogs, Farming, Homesteading, Off-Grid, Self-Sufficiency, Solar Hot Water, Sun Oven. You can follow any responses to this entry through the RSS 2.0 feed. You can leave a response, or trackback from your own site.